Back in late August, the incredible folks at VisitPITTSBURGH invited the Mashing In crew to their city to partake in a Brew + Brew Press Tour, a guided three-day tour of the fine breweries and coffee roasters/shops located in Pittsburgh, Pennsylvania. We returned from the trip with the intention of writing an exhaustive, beer-travel-themed, “Where to go for a pint while in Pittsburgh”-style post, but something just did not feel right about that approach when we started putting pen to paper. After meeting with some truly amazing people that are actively impacting and uniting Pittsburgh communities through beer culture, we just knew that our time would be better served bringing a couple of their stories to light in this two-part series. The intention of these posts is to hopefully spark your curiosity and inspire you to go see for yourself how some amazing craft breweries are reshaping the areas in and around the city of Pittsburgh. Brew Gentlemen’s warm and inviting entry. 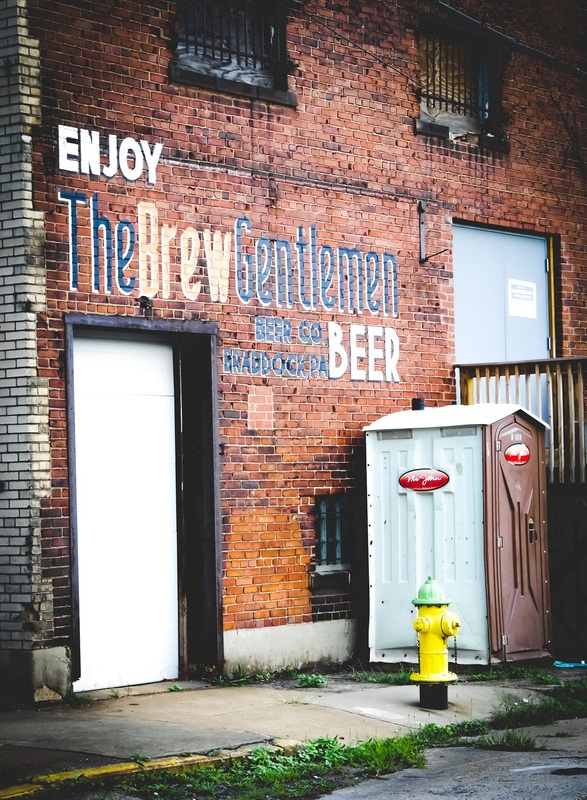 Our tour of Pittsburgh hit the ground running with a lengthy half day that eventually carried us out to Braddock, Pennsylvania to check out Brew Gentlemen. Since it is quite normal for breweries to be located in industrial parks or metal buildings far removed from the hustle and bustle of downtown, I was happily surprised to find myself standing on a main avenue when I exited the bus. With its inviting storefront entrance and muraled side wall, the initial impression of Brew Gentlemen from the outside was that it had the feel of more of a small-town hardware store than brewery. Step through the front door and the surprises continue as you are greeted by an open seating area that has an incredibly clean, industrial chic motif – exposed brick, bare bulb-style lighting, metal ceiling fans, and an accent wall displaying an illuminated and stylized “BG” logo, minimalist shelves constructed from pipe and wood, and delicate floral touches. A quick right takes you into the taproom that carries on the industrial aesthetic with a long expanse of the building’s original brick proudly adorned with Braddock’s zip code (15104), a wood accented tap wall, digital tap list, vintage tin ceiling, a gorgeous L-shaped bar and additional seating at the back. The space continues as it snakes back to the left, taking you into a sitting room that has a view of the brewery and contains shelves filled with books and board games and a 3D printer that is hard at work on an undisclosed project. From the front of the building to back, everything has a sense of trend-setting style while still maintaining a high level of functionality and comforting warmth. Matt Katase, Co-founder of Brew Gentlemen, accounts the history of his brewery. After a brief look around the taproom, we returned to the bar to find Brew Gentlemen’s Co-Founder Matt Katase waiting to greet us. Once everyone was settled in with a beer in hand, Matt went on to tell the story of the brewery. The inspiration for Brew Gentlemen was found in 2010 when Katase and Asa Foster, friends and students at Carnegie Mellon University who shared a love for good beer, decided to alter their college path from degrees in Art and Math to “self-defined majors” that would ultimately help them open a brewery. Despite a brush with expulsion for brewing beer on campus, the duo graduated in 2012 and immediately sought out a location for the brewery. That search led them to Braddock, a town that quickly established itself as the soul of Brew Gentlemen. You see . 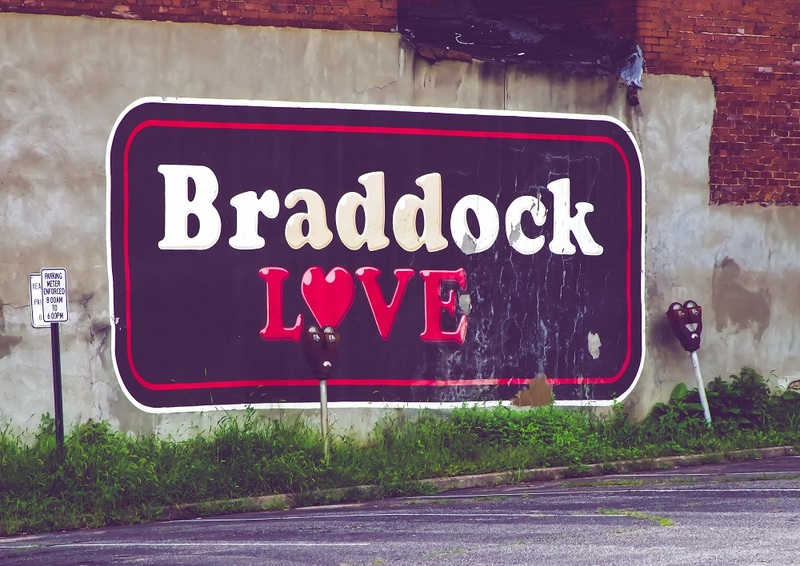 . . Braddock is a town that has fallen on hard times. With a history that dates back to 1755 and the role General Edward Braddock played in the French-Indian War, Braddock did not really flourish until a little over a century later when Andrew Carnegie showed up to build the Edgar Thomson Steel Works. This move made Braddock a prominent player in the steel industry, carrying the town at a great height through the majority of the 20th century. Sadly, the steel industry collapsed during the 70’s and 80’s, and Braddock fell with it. Buildings were shuttered, the people left in search of new jobs and opportunities, and the town was left dejected and directionless. A good deal of Braddock remains in this condition at present day. MIYABI – An aesthetic ideal meaning elegance. Everything is just as it should be. SHOSHIN – A concept from Zen Buddhism meaning “beginner’s mind.” Openness, eagerness to learn. Many possibilities. KANSO – An aesthetic ideal defined as simplicity. Identifying that which is essential. KAIZEN – A business philosophy for continual improvement. Thrive on change and making things better. Use every day as a chance for improvement. After just ten minutes of hearing Katase speak about his brewery, it became quite clear that kaizen, or continual improvement, is at the very heart of Brew Gentlemen. Proof of this arose when a journalist in our group asked if Brew Gentlemen had any collaboration projects in the works. Collaborations are a very common, popular and lucrative practice in today’s craft beer community, and the beers coming out of Brew Gentlemen – from its flagship General Braddock’s IPA to its limited release Barrel-Aged Annuals and the experimental beers of the 15104 Series – have generated quite a bit of buzz for the brewery on a national level. This degree of hype would certainly have dozens of breweries from across the country clamoring for the chance to work with Brew Gentlemen, but Katase simply responded by saying that they do their best to avoid collaborations because they feel that their time could be better spent improving their brewery, their craft and their community. Kaizen certainly drives everything at Brew Gentlemen, but we soon learned that it is not just limited to what is found within its walls. This realization came gradually as Katase led us into the brewery for a tour – a small to medium-sized operation that includes a couple small foeders and a space for barrel-aging – and then behind the building where he outlined some ideas concerning future expansion. Despite this portion of the visit being somewhat abbreviated, an excitement could be seen growing on Katase’s face and all made sense when he finally asked, “Do you guys want to go for a walk?” Katase explained that this is a walk that he attempts to do every day so that not only can he be seen taking an interest in Braddock but also so that he can be constantly reminded of its existing beauty and growing potential. After a long day on the bus, a chance to stretch our legs sounded fantastic to all of us, so we placed our beer glasses on the brewery floor and off we went. 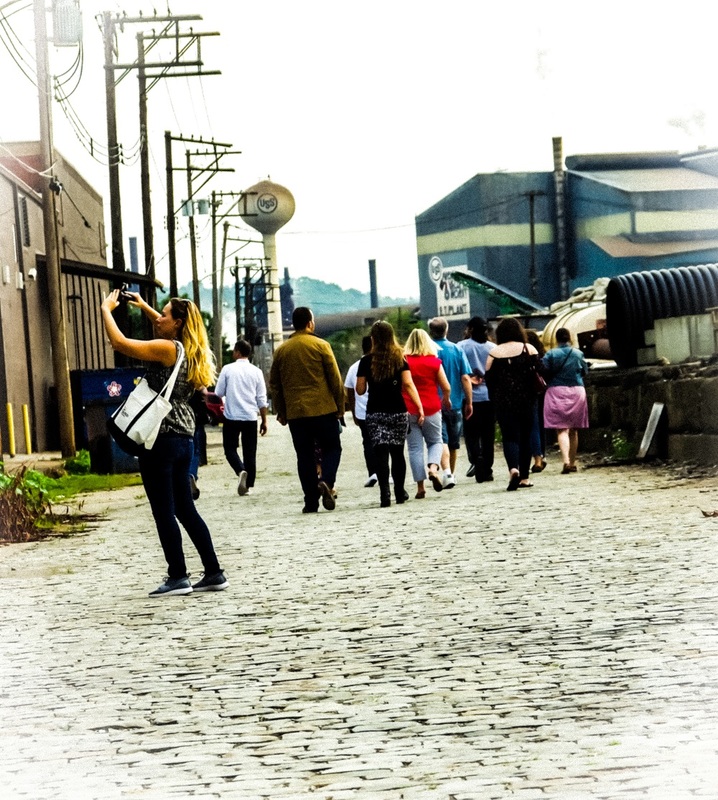 A dozen or so journalists following Matt Katase through the streets of Braddock. 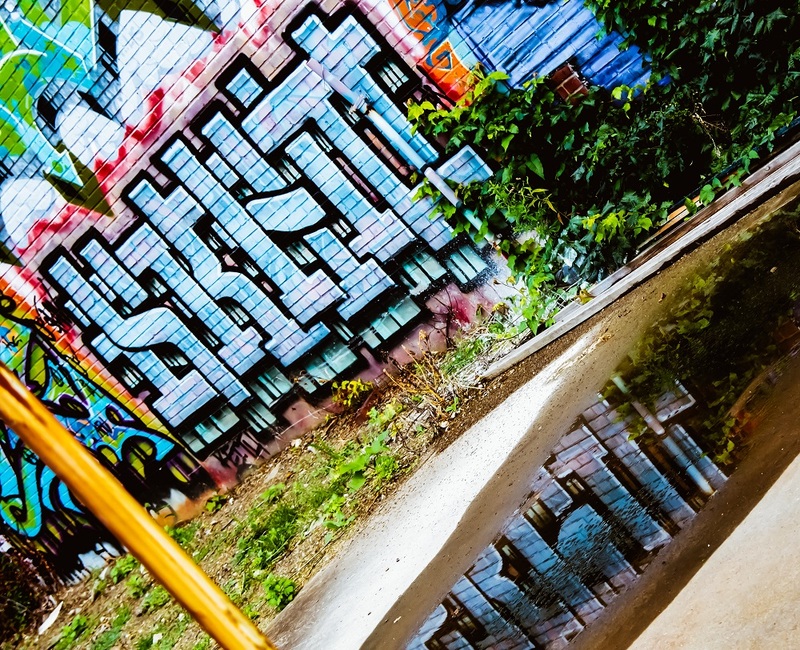 The building’s of Braddock now serve as a canvas for elaborate works of graffiti. 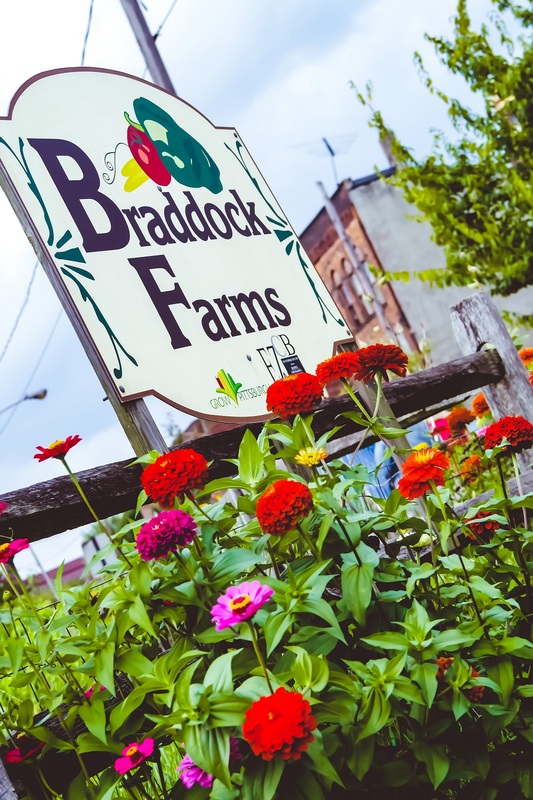 Braddock Farms brings hope and fresh produce to Braddock. 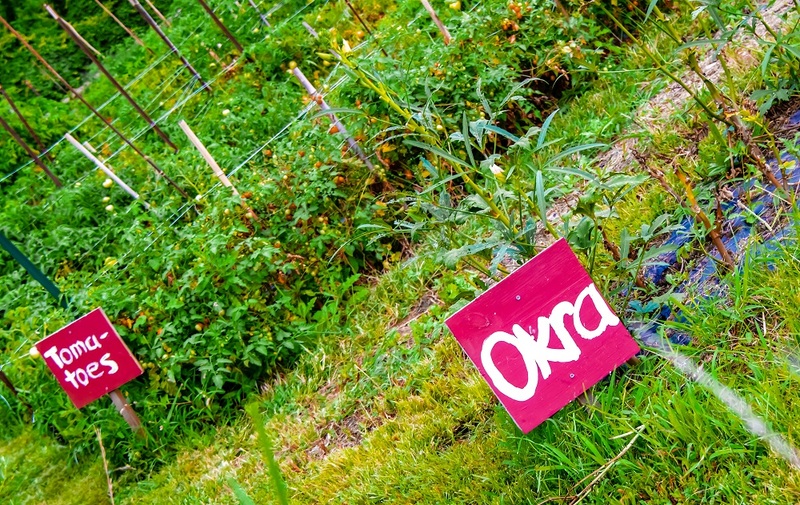 Fresh vegetables grow just steps away from city streets. 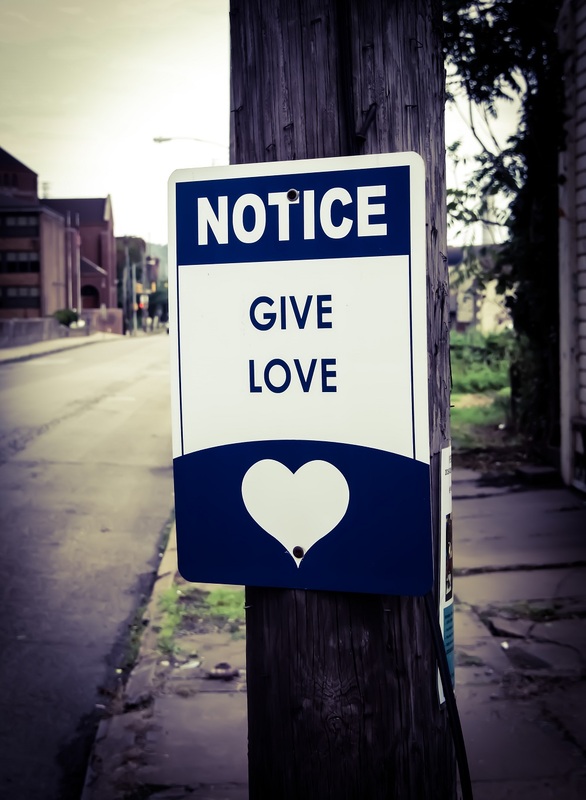 For Good PGH, founders of The Hollander Project, also place inspirational signs throughout Braddock. Several blocks away, a building that nearly became the home of Brew Gentlemen still bears its name. 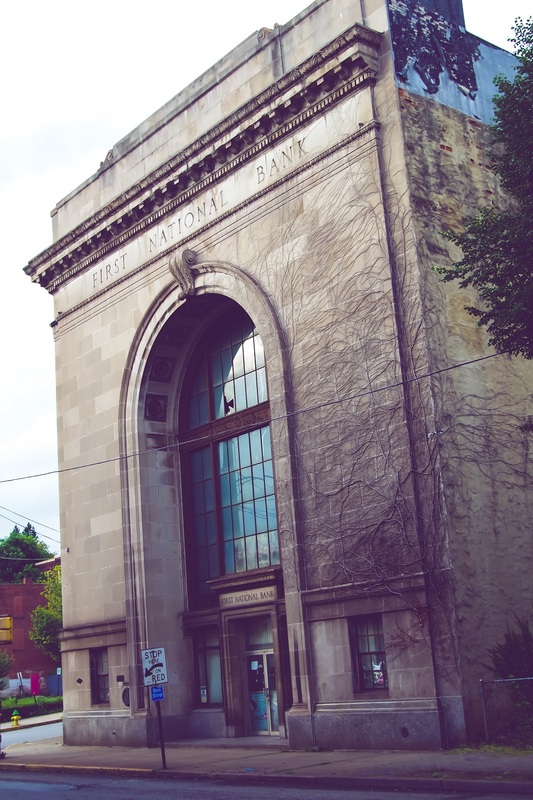 Braddock’s stately bank building falls into disrepair. 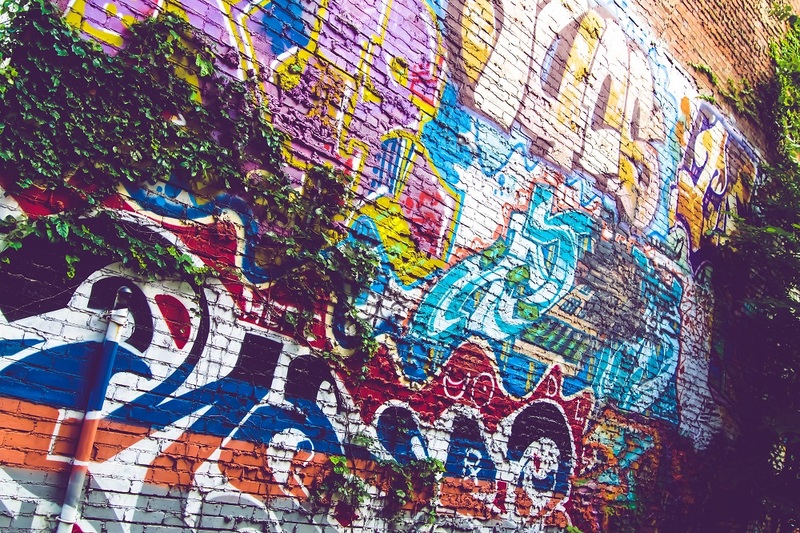 Graffiti overcome by vines and overgrowth. Starting on the cobblestone side street that runs behind the brewery, our adventure took us southeast for several blocks. The industrial might of Braddock’s past dominated the skyline while numerous abandoned buildings adorned with elaborate graffiti displays were at our left and massive storage lots for construction materials sat to the right. Each building had a story – ranging from being once proud businesses to the offices of prominent figures in town to even a respected newspaper entity – and Katase was happy to tell them all. After about a half mile, the scenery morphed into an expansive green space that houses Braddock Farms, an urban farm that grows produce literally in the shadow of the area’s last remaining steel mill. After walking the farm, we looped back around to Braddock Avenue so that Katase could show us The Hollander Project, an innovative coworking space that offers local female business owners the crucial resources needed to succeed. He then took us by scaffolding-lined stately buildings that were having their facades – blackened after years of exposure to the soot supplied by local industry – restored to their original bright white. Eventually, as we drew closer to the brewery, this uplifting stretch that showed so much potential and improvement gave way to more desolation as abandoned buildings once again began to pile up on both sides of the avenue. For so many, a situation such as this could easily be perceived as bleak and impossible, but it honestly looks like nothing but hope when seen through the eyes of Katase. He chooses to fixate on the positive things happening in Braddock and forces anything negative to translate as a blank canvas full of potential. It is obvious that he only sees a chance for improvement. He only sees another opportunity for kaizen. It was then, in that moment, that everything suddenly became clear. Brew Gentlemen, from the high quality of its beer to the facility’s pristine appearance, is a physical embodiment of what Braddock once was and could be again. Hard work, dedication to a craft, and a vision of excellence – all noble attributes that so many steel workers once carried through that town – have earned this brewery a prestigious level of hype in the beer community. This buzz is powerful, and it is now making people across the country talk about Brew Gentlemen. It is making people talk about Braddock again. Now that beer tourism is a very real thing and at an all-time high, this tiny little brewery could just be the spark that lures visitors back to Braddock. Craft beer could replace steel and support this community. Absolutely mesmerized by Katase’s passion for Braddock, I got back on the press bus with my mind already made up that I will be returning to Brew Gentlemen in the very near future. Sure, some of the motivation for a return trip is to enjoy more of this brewery’s world-class beer, but the majority of it is rooted in the chance to take that walk again and see how Braddock has thrived with the help of Katase, everyone else at Brew Gentlemen, and all the other like-minded visionaries determined to create change in that community. I left convinced that Braddock will recover from its lows. I left knowing that Brew Gentlemen will somehow find a way to fuel that rise.